DOMESTIC VIOLENCE CAMPAIGNER RECEIVES TOP HONOUR AT PREMIER’S HARMONY DINNER. 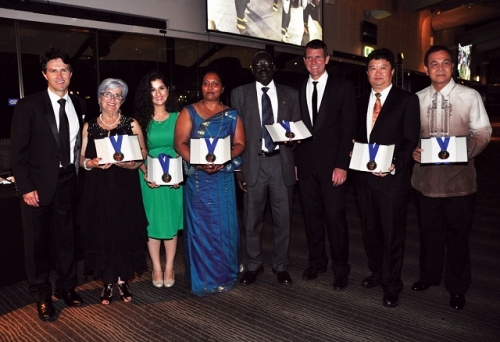 Premier Mike Baird and Minister Victor Dominello with medal winners at the Premier’s Harmony Dinner (Rosehill Racecourse, 12 March 2015). (l-r) Victor Dominello, Paroula Galelis-Thurban, Sarah Yahya, Nalika Padmasena, John Moi, Mike Baird, Jeff Li and Ruben Amores. (Youth Encouragement Award winner William Ho was unable to attend the ceremony). A Sri Lankan woman who encouraged women from culturally diverse backgrounds to open up about family and domestic violence issues has received the top honour at the Premier’s Harmony Dinner. NSW Premier Mike Baird awarded the prestigious Stepan Kerkyasharian AO Harmony Award to Nalika Padmasena in front of more than 1,300 people attending the annual event at Rosehill Gardens Racecourse. “Ms Padmasena worked in legal services at Toongabbie after arriving in Australia from Sri Lanka in 1995. She chaired the Immigrant Women’s Speakout Association and volunteers at the Sinhalese language school at North Parramatta in her spare time,” Mr Baird said. “Women in Australia enjoy many rights that women in other countries do not. We recognise the work she has done to inform female migrants of their legal rights while providing safe environments for them to speak out about domestic violence. “I’m proud to offer Ms Padmasena this award, which comes a week after I announced that if re-elected, the NSW Government would trial a scheme to allow suspecting women to access information on whether their partner has a history of violence. Minister for Communities and Citizenship Victor Dominello said the Premier’s Harmony Dinner, now in its fourth year, was a celebration of cultural diversity – the state’s greatest economic and social asset. 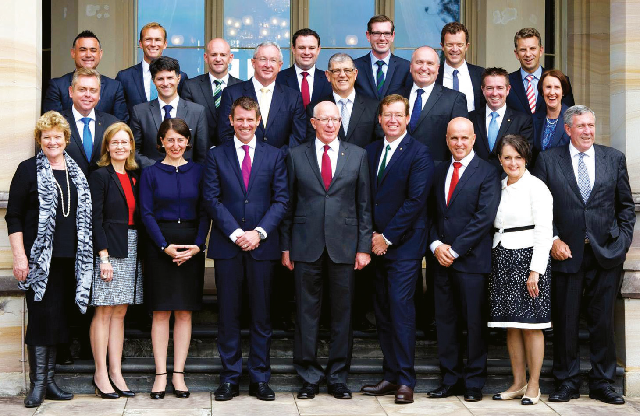 “The Premier’s Harmony Dinner is an opportunity to showcase the rich heritage of our many multicultural communities and a time to celebrate the shared values that unite us as Australians,” Mr Dominello said. and Citizenship Victor Dominello and Philippine Consul General in Sydney Anne Jalando-on Louis. Nalika Padmasena for her work promoting justice and human rights by facilitating forums for migrant women to discuss family and domestic violence, and encouraging dialogue between religious and community leaders on these issues. Sarah Yahya for her work assisting refugees and asylum seekers within the Mandean community of Western Sydney. William Ho for his role advocating lesbian, gay, bisexual, transgender, queer & intersex rights through community engagement projects on the NSW Central Coast. Ruben Amores for his role in establishing the Auburn Small Community Organisation Network and Kapit-bahayan Cooperative providing cooperative housing services.